The new DVP-NS999ES player offers a variety of advanced technical features available from the leader in innovative home entertainment. Technical advancements include Precision Cinema Progressive output and multi-channel SACD playback, as well as Pixel-by-Pixel Active I/P Conversion for sharp and detailed video projection, and Audio-Video Alignment to produce precise on-screen picture and sound synchronization. Superlative player; delightful design backed up by tank-like build quality. Exquisite video performance, accurate and detailed surround sound (both for movies and for 5.1 (and stereo) SACD replay - which is a revelation to listen to - fantastic chance to rediscover some classic albums - Brothers in Arms, Dark Side of the Moon, Goodbye Yellow Brick Rd & Wish You Were Here to name just a few). Finally, we just need to address the CD replay issues another reviewer flagged - firstly, this is a DVD Player with SACD capability, so you might just as well review it on the basis of its picture disk performance! Secondly, I have owned some superlative dedicated CD players over the years (including the legendary CDP-X555ES); the 999 is as good as the best I have heard - and also makes a great CD transport, if you wanted to decode its digital output with a separate DAC. I have absolutely NO RESERVATIONS in giving this player a FIVE STAR REVIEW. darn good video sacd even redbook sounds great. layer change a bit slow but is that really a big deal? some croma issues but at least in my case not too bad. 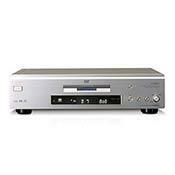 denon dvd2900, sony scd-c2000es, sony scd-c222es, sony dvp-nc555es, samsung dv841. Well built, heavy for a DVD player, good looks. Almost every aspect of video and sound can be adjusted from the unit. Remote is a bit akward at first, but you get used to it. The 999ES is a very good DVD player, which is primarily what I bought it for. I have been very satisfied with Sony ES equipment in general. Those who have been disappointed with their products may have missed the many tweaks that they have. SACD audio was, to say the least, poor until I went through the audio setup to dial in the speaker distance, equalize speaker volumes, etc. You must turn off the front display and, on the 5ES receiver, use analog direct to get the best results. The sound quality of multi-channel SACD, such as on Norah Jones' excellent "Come Away With Me" only rivals standard CD if the player is set up right. Unlike the Sony DVP-S7700, which plays CDs very well right out of the box, you have to make adjustments to the 999ES to obtain maximum sound (try using CD Direct and setting the Audio Filter to Slow). The DVD video is awesome. If you have any complaints, you have not tweaked enough. It gives an excellent picture in interlaced mode, as good or better than the S7700. I have never seen digital artifacts with this player. The Superbit version of "The Fifth Element" looks almost as good as HDTV on my regular old Sony KP43-T70 television. It also plays damaged discs as well as any other player, a handy feature when you use Netflix (I have done some testing of other players at home theater stores). Yes, it is slow to switch between layers (what Sony player is not? )and the remote has these dinky buttons behind the slide panel. Fortunately, I rarely use the remote except when I am setting up the player. I do not have a progressive-scan TV yet, but I plan to get one and that, together with SACD playback is the reason that I upgraded to the 999ES. Another nice thing- prices traditionally come down on Sony when they introduce new models and there are lots of used players out there. This player is a real bargain since you don't have to pay $1000 for it now. Able to do both cd and dvd very well. I can't think of any for the price. CD performance is very good but not great. Not worth $1000...the buttons on the faceplate will not work right if it is not press straight on. The picture quality is good, but I don't think it is that much better then the Denon 1600 I had. SACD sounds great on it, but I am slowly getting less interested in SACD because of the lack of media. Playing CD on it is ok. I guess I am just expecting more from it since it is a $1000. Maybe I should have gotten the 9000es used for half the price. Overall I am satify, but not thrill about its performance. Denon 1600, Pansonic, PS2, and older Sony DVD player. Build quality and reliablity so far. DVD sound. Picture quality is stunning after calibrating my monitor using Video Essentials.